NNI Posts | Northland Neighborhoods, Inc. Better housing, better communities, better lives. 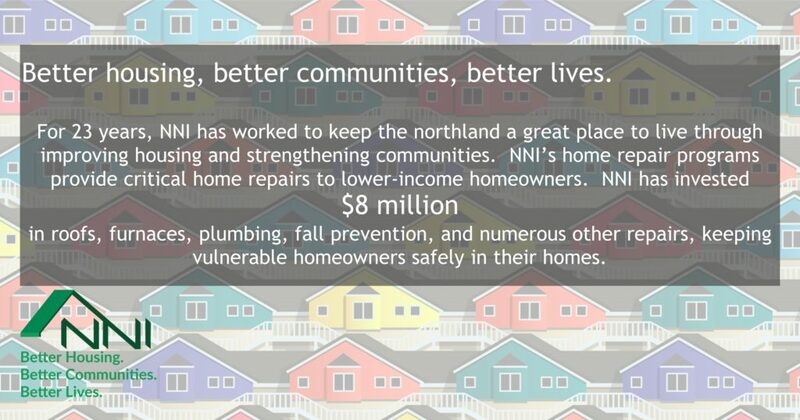 For 23 years, NNI has worked to keep the northland a great place to live through improving housing and strengthening communities. NNI’s home repair programs provide critical home repairs to lower-income homeowners. NNI has invested $8 million in roofs, furnaces, plumbing, fall prevention, and numerous other repairs, keeping vulnerable homeowners safely in their homes. NNI helps to keep neighborhoods strong, supporting homeowner associations with Crime Watch and other training. NNI’s monthly programs such as Meet Your Councilperson connects citizens with elected officials and governmental agencies, giving northlanders an important voice in their communities.